Successfully Added Quad Band Dual SIM Cellphone - Slim Touchscreen Mobile (Black) to your Shopping Cart. Quad Band Dual SIM Cellphone - Slim Touchscreen Mobile (Black). Slim profile four band GSM unlocked dual SIM cellphone with 2.6 inch touchscreen for worldwide use. NOTES: (1) This product is compatible with GSM at the four frequencies of 850MHz, 900MHz, 1800MHz, 1900MHz. This mobile phone can be used throughout the world. (2) The second SIM card slot will not register properly with your carrier if you live in Brazil, Ireland, Sweden or the Netherlands. Both SIM card slots will work fine in all other countries in the world. If you live in these two particular regions we suggest you choose another mobile phone model with dual SIM card slots. 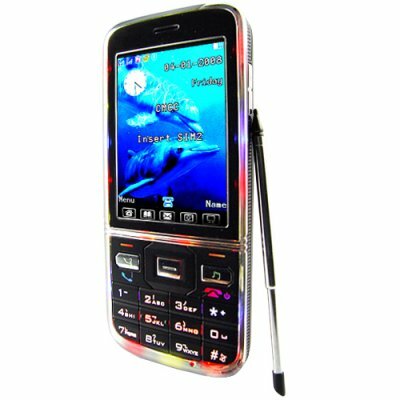 Resellers: Another good description to put in your listings could be "Unlocked Two SIM cell phone with color LED lights"
Received in rural Western Australia within 2 weeks, phone exactly as documented on Chinavision website. Works great & easy to use, well worth the price, thanks CV. Baught cell phone with TV- unfortunately we have only DTV i Sweden- so its no thrill- but the rest is enough to be satsfied- so far I´m surprised by size and performance- Will order more from you - best of all- private senderadress!! I bought this phone for my friend and he really likes it. Im going to buy more so I can sell them. Recommend these to everyone. The lights are pretty cool too.